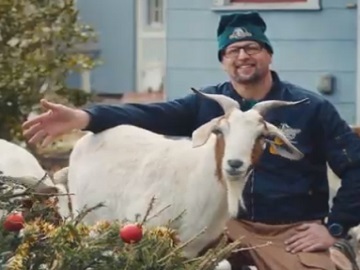 Head & Shoulders presents, in one of its Super Bowl 2019 commercials, entrepreneur Michael Swanson from Decatur, Georgia, as a “headstrong business owner” for having open a goat rental business. The spot shows some of the 200 goats Michael has and reveals that, when he started his goat rental business, his wife thought he was crazy. “But Michael is a headstrong business owner and now his wife’s eating her words while his goats are eating everything else,” says the voiceover, who is followed by Michael urging viewers to call him the next time they need their land cleared instead of calling a landscaper. “No job too big, no job too small, and no question asked” he adds, while his goats are seen clearing quite many things, from a neighbor’s lawn to a football field, to a Christmas tree thrown away in a garbage bin, to some items labeled as “top-secret”. The commercial ends with the voiceover saying that “Head&Shoulders made this Super Bowl commercial so Michael could stay headstrong”. The Georgia-based goat rental company, founded in 2009 by Michael and Kristin Swanson, is only one of the unique local companies highlighted by Head&Shoulders in its three Super Bowl LIII ads. The other two are KC Weddings 2 Go, a mobile wedding service based out of Kansas City, Missouri, and Smash Therapy in Houston, which provides customers a safe place to vent and smash things.